If you need to sand your deck, and you would like to do so in a professional manner, you will need all of the tools that can help you get the job done fast. This will include a sander, sandpaper, and other tools that may be necessary for this type of job. The type of sandpaper that you get should be no more than 60 or 80 grit. If you want to finish the job, grit above 100 is recommended. Once you have all of this ready, you will also need to get your respirator, safety goggles, gloves, and preferably clothing that will protect your skin from the fine sand that will be on the floor and in the air. Let's begin with the process of how to sand deck railing the right way. Before you do any sanding at all, it is absolutely necessary to start with a pressure washer. This could be a power washer as well, depending upon the type of unit that you have invested in. It is recommended that you allow this to dry over the course of several days. You need to have a fully dry deck in order to sand it the right way. When using the pressure washer, be sure that you do not keep the water spraying in one location for longer than a split-second. It will be at an angle, and as you are spraying it may cut a groove or notch into the lumber. Once this is done, and it is fully dry, will move on to the next step. You will want to begin from the top down. That means you will begin with the railing. If you have looked at tutorials on how to sand deck railing, you will see that it's actually very easy to accomplish. You can do this with the power sander, using the course grit, and then use grit above 100 for finishing your sanding of the railing. It is important to do the finer sanding by hand if possible, specifically around the edges. That is because the slightest wrong move can etch a mark into the wood. This is where you must be very careful, and when you are doing a large deck, you will become very adept at going fast and slow when necessary to avoid any mistakes. Once you have done the railings, you will move on to the floor. Some people go in the reverse order. They prefer to get the floor of the deck done prior to moving upwards. The deck itself needs to be sanded using the coarser sandpaper. You will literally be on your hands and knees with the power sander for several hours. Be very fluid with your motions, making sure to not remain in one spot for very long. In the same way that you were sanding the railing, you will use the same motions but on a larger scale. Once you have completed with the course sandpaper, you can then move on to the fine sandpaper. However, unlike the railing, it is recommended that you attach the 100 grit sandpaper to the power sander this process. That is because you do not have to worry about edges, allowing you to go very fast as you are completing this major portion of the deck. If you have a larger deck, it is recommended that you only do this a few hours a day. 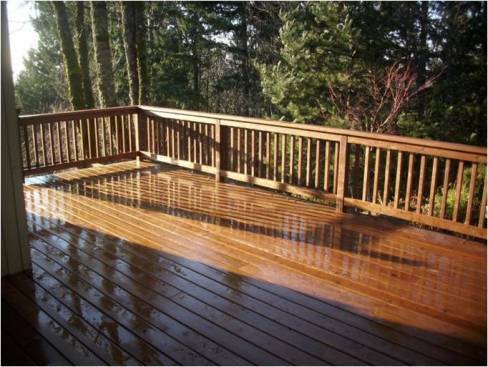 Once you have completed this project, you will then have the ability to stain your deck you want to. Prior to doing so, it is necessary to use a blower to remove all of the excess sawdust. If you can do this over the next few days, you should be ready to stain your deck by the weekend. It can be a week long project, depending upon the size of your deck, but it is something that one person can easily accomplish. Now that you know how to sand deck railing properly, as well as the rest of your deck, you should obtain all of the recommended supplies and tools so that you can get started. You can also visit this site to learn more about Deck Sanding.